Ponte en la piel de un arqueólogo y un explorador de la jungla en este tour combinado de Belice con las antiguas ruinas mayas y un emocionante circuito de tirolesa. Explore la ciudad excavada de Altun Ha con guías expertos, y aprenda sobre la antigua civilización maya y una misteriosa cabeza de jade descubierta aquí. Luego, vuele a través de las copas de los árboles con siete cables de tirolesa diferentes en la zona de aventura Rainforest. Vuela por la jungla de Belice en una clásica aventura de tirolesa. Tour guide was wonderful! A great, fun, efficient tour. Ruins were very enjoyable and zip line was excellent!! Had a great trip with Joel! He was very informative about Altun Ha and very hospitable. The zip line was also an amazing experience. Definitely recommend! Wir hätten einen klasse Guide, der uns sehr viel über die Maya - Ruinen erzählt hat, unser aber auch die Natur und Pflanzenwelt näher gebracht hat. Insgesamt ein toller Tag mit einem schönen Abschluss, dem Zip-Lining. When doing an excursion activity from Belize City, it's always better to get to your destination before the cruise ship passengers arrive in the droves and crowd things up. Belize infrastructure and tourist personnel are not really able to cope with a large number of guests trying to gain admission all at the same time. You will have to wait up to half an hour to get in if you arrive with all the cruise ship passengers. Altun Ha is a good Mayan site to visit. 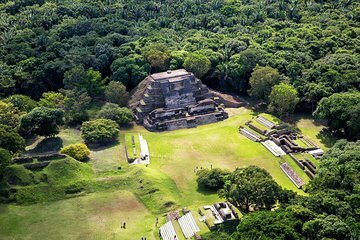 If the Belizean government had the money and will to excavate the remaining 80 % of Altun Ha that remains inaccessible to tourists now, then Altun Ha would be an enormous Mayan city tourist site. However, that would change the "ecotourism" phiilosophy that you see today throughout Belize. Belize currently has dirt roads with lots of potholes prone to flooding and nature at its raw best form, not so much paved roads with lots of tourist trappings.